Amaryllis Time Lapse - In A Colorado Minute (Week 193) from Luci Westphal on Vimeo. 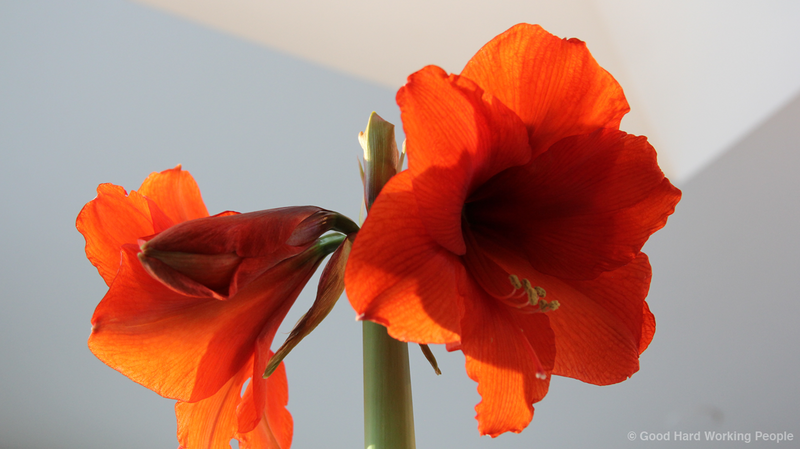 Every winter, I get an amaryllis bulb to watch the plant grow and open its blooms to fill the winter days with brightness and remind me that spring is coming and the new year will bring much joy. I shot this video over 4 days and 3 nights - taking a picture every minute (actually I took a lot more pictures, but I deleted them later). There are a few jumps in the video because I had to adjust the camera when the plant itself grew out of frame and because the camera battery gave out in the middle of the night. This video is also a reminder that I didn't go outside this week to film because I was so busy with work (yay, 2014, the year of much paid work!) and furnishing our new home and because of the polar vortex, which dropped temperatures to -22 Celsius during the day!!! By the way, this plant that is usually sold under the name "Amaryllis" during the winter months as a flowering indoor plant is actually called "Hippeastrum" and originates from South America. The true "Amaryllis" grows outdoors in South Africa. The two plants look a lot a like and are related. Note to self: go explore South Africa one day. The pretty song is the instrumental version of "She Dreams in Blue" by Josh Woodward. Please check out his website and feel free to use his music in your works - he is that generous and makes his songs available via a Creative Commons license: JoshWoodward.com Thank you, Josh!